For two full weeks, take a flavorful tour of Galveston’s vibrant dining scene during Galveston Restaurant Week. Enjoy specially-priced menus at participating restaurants, with donations from the event dedicated to a different local charity each year. This foodie-friendly event features a 5K Fun Run/Walk, live music, a washer pitching tournament, a margarita contest, the ever popular Downtown Walkabout among the downtown merchants, and craft beer, but the real highlight of the weekend is the chili cook-off competition, where numerous teams will earn serious bragging rights with the best chili in town. Celebrate at the third-largest Mardi Gras event in the U.S., spanning two weekends and complete with millions of Mardi Gras beads, more than 30 concerts and parades, including family-friendly festivities. Hosted by Mitchell Historic Properties and the Galveston Convention and Visitors Bureau, this free Saengerfest Park event invites families to enjoy a series of beloved movies under the stars. Get a taste of Galveston’s thriving local music scene with this free live concert series at Saengerfest Park, hosted by Mitchell Historic Properties and the Galveston Convention and Visitors Bureau. 27-Apr Fab Five (Beatles Tribute) Starts at 7:30 P.M.
Every year, hundreds of unique bird species pass through Galveston on their migration along the Great Texas Coastal Birding Trail. Featherfest is a celebration of the city’s feathered friends, offering visitors a chance to experience nature adventures, photography field trips, a photo contest, exciting presentations, and more. Wine-lovers unite for this annual celebration of the best in Galveston, featuring more than 25 vineyards and a number of fine restaurants and artisan vendors. The weekend includes unique dining experiences, tasting events, and a Champagne 5K Fun Run. The Galveston Island Beach Revue began in 1920 to kick off the summer season each year. As a nod to the golden years of Galveston, this event features contestants from across the country modeling vintage swimwear. The event also features live music and a vintage car show. 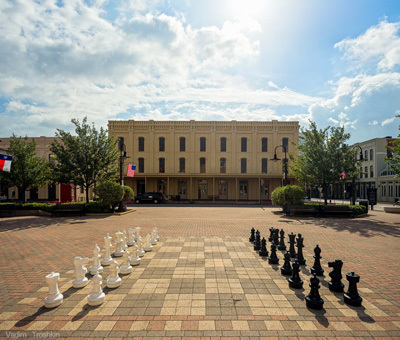 Experience the history and beauty of Galveston’s historic downtown lofts as a handful of locals open their private homes to the tour, offering a glimpse at the restored grandeur of the town’s most famous buildings. Proceeds from the event benefit local programs and advocacy efforts. Browse unique fares and artisanal creations from talented Galveston locals in a friendly, laidback market in Downtown Galveston. Hand-crafted items for purchase include jewelry, artwork, food, home goods, and more. Revel in one of Galveston’s most famous staples at the Galveston Island Shrimp Festival, a celebration of the island’s seafood of choice. Enjoy sampling the best gumbo during the Gumbo Stroll, with cook-offs that include both professional chefs and talented at-home cooks. The entire family can take part in the event, including the Lil’ Shrimps Parade, Merchant Walkabout, and 5K Fun Run. A free annual event hosted by Mitchell Historic Properties, the Mini Monster Bash is an exciting way for families to get into the Halloween spirit. Come to Saengerfest Park for kid-friendly games, crafts, face-painting, and costume contests; then go trick-or-treating at participating businesses throughout the downtown area. Cruise down for the Lone Star Rally and experience the largest motorcycle rally in North America. The weekend includes custom bike, trike, and slingshot contests, live music, a sound-off competition, and a unique motorcycle rodeo featuring exciting trick riding and impressive shows of skill. Saengerfest Park and historic downtown Galveston come alive with a breathtaking display of holiday lights and artisan-made pieces. Enjoy the beauty and holiday spirit of downtown with a stroll through this winter wonderland. Shop amidst beautiful Victorian architecture for one-of-a-kind gifts in the many boutiques, antique shops, and art galleries that call the Strand National Historic District home. The Strand is the heart of a vibrant downtown and waterfront harbor, offering 70 blocks of shopping, dining, and attractions. One of Galveston’s most beloved holiday traditions, Dickens on The Strand, will transport you back in time to Victorian London, complete with live performances, unique vendors, strolling carolers, roving musicians, bagpipers, and more. Victorian attire is encouraged, but not required. All aboard for a magical meeting with the jolly man in red, as Santa arrives in Galveston on the Harborside Express train. Santa arrives at noon and will be available at the Depot to meet with children and take photos. The museum’s Garden of Steam will be decked out with holiday cheer, complete with lights, decorations, and lots of Christmas spirit. Train rides on the Harborside Express will take place at noon with Santa’s arrival. Visit here to check out our calendar of events in Downtown Galveston. Looking for a space to rent for that special event? Consider something unique and historic. For the latest news about Galveston past and present, check out our blog. From small art events and exhibits to full-blown festivals, Downtown Galveston offers events year-round.